Pros: Big, beautiful, super thick glass,solidly made. the set of perks with a little ice above them makes this pipe hit like dream. Cons: Wish I had bought one sooner! Pros: Thick glass, tree perc looks beautiful and the ice pinches have these cool grooves on them. You can haul monster rips off this thing! Cons: The tree perc area is a bit difficult to clean, the angle of the down stem is a little annoying because tightly packed bowls spill a little bit of herb if set on a flat surface but if you use an ash catcher, its not much of an issue. Comments: I have had this bong for a few years now and its still my daily piece. The down stem and bowl broke a while ago sadly. Comments: Amazing price for the size and thickness, got to me in around a week but I also live on the east coast so that's understandable, when I first received this pipe about half of the tree perc's arms didn't have slits cut all the way through. I called up the company and they immediately said they'd replace it for free, awesome customer service! Would buy again. Pros: I bought this piece back in 2010, has taken a LOT of falls and just recently I've had to Epoxy a crack that had developed in the base. Plain and simple, this is a great tube. Match this up with a shower head perk down stem with a steam ash-catcher you are in for some monstrous smooth rips. Don't debate on this one. Shenanigans has given a lot of good nights, and I hope to still have her in another 5 years. Pros: Great smooth hittin' tube Batman !!! Thick durable clear & beautiful.. Damn near perfect! Cons: It came w/a 14mm funnel bowl. Hate funnel bowls and prefer 18mm bowls. but I love it and am doing some more shopping here today.. Great quality and value at a great price..
Pros: So smooth you'll think you forgot to light it. Great beaker shaped base doesn't tip easy.. I am totally pleased with my new bong.. Comments: Excellent quality... Can't beat the price for 7mm glass.. Couldn't be happier with my purchase..
Pros: Fast shipping, packs a punch, bubbling filtration, what more could you ask for? Pros: PERFECT piece, I was so surprised to find out that my water pipe actually had very high quality tree perc with 7 or 8 tree percs! unlike seen in the picture. Also came with a diffused downstem that fits perfect. This waterpipe rips with very little drag. It is a perfect size for chillin on the couch. I give this water pipe 5 stars. Pros: This is my first water pipe and it's awesome. Huge hits, and super smooth The bowl that it comes with is really deep. Comments: Good deal for a great piece. Cons: The only real con is that the mouthpiece on mine is MASSIVE and flares out making it hard to seal fully unless you open your jaw up and press your face right into the glass. . . pity that because if it was not for this one final thing, It would be a smasher piece and I almost wanna sell it cause of this. . Comments: Minus the huge mouth and the getting used to it took, killer piece for the price. 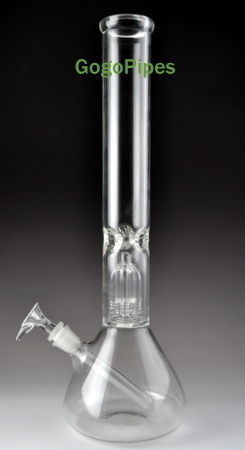 . .
Pros: I ♥ this water pipe! It's maybe just a little big for me. However, the glass is thick, it's well made, the glass on glass makes cleaning easier, hits awesome. After 17 years, this may be my favorite yet. Simple and to the point. Cons: kills lungs and throat. Pros: I love this bong. It makes really cool rips. Also it is so smooth even on huge hits. Cons: The biggest con for this piece is the extremely small bowl. I am going to have to get a new one because this one is much too small. Also the holes on the dome perk are kinda of messed up but it still rips. Comments: There are a few cons but the pros defiantly out weigh the cons. Also the price is defiantly right so if your on the fence this piece is a definite must buy.